The word triage is of French origin and derives from the word “trier,” meaning to sift, to sort out. It came into prominence during the Franco-Prussian War of 1870-71 when battle casualties were tremendous and the French army medics were hard put in their limited efforts and resources to try to save what they could of the overwhelming number of wounded and dying on the battlefield. Since it was completely impossible to save all the wounded, rather than pursue an ineffective response of flailing out in a chaotic manner of confused desperation, they had to make some hard decisions. For one thing, they had to decide on whom they could still save, and whom it would be an exercise in futility and a waste of their precious time and resources to try to save. The hopeless and impossible cases were left to die. Let me illustrate one more example. When the then super ocean liner Titanic struck an iceberg in the North Atlantic on April 14, 1912, its sinking caused the loss of 1,517 lives, according to a Funk & Wagnalls Encyclopedia. Because of indiscretion and unpreparedness, when the disaster was upon them, the crew (and some of the passengers), too, had to make some hard and ruthless decisions, and they had to make these decisions in a matter of less than two hours and 40 minutes before the ship sank. They knew there were not enough lifeboats to save all the people aboard. So the decision that had to be made in rapid order was : whom should they allow into the lifeboats, and whom should they leave to drown with the sinking ship ? They had to make some quick decisions of principle and then on the basis of these principles sort out the people they would save and those they would not save. It seems the consensus of those decisions, whoever made them, was to “save the women and children first.” They, too, had to establish their priorities, and they did – a priority that set a precedent at sea for decades to come. Whether or not this was the only criteria, or even the best criteria for sorting out those who should live and those who were left to drown, can be debated endlessly. The fact of history is that 1,517 were left to drown. Of this number there were 832 passengers, mostly men, and 685 of the crew, also mostly men. But 706 were saved, mostly women and children. There were many instances of heroics, of self-sacrifice and bravery. There were also a number of instances of cowardliness, selfishness and meanness, but they were in small minority. The fact that the captain went down with the ship and 685 members of the crew along with him speaks for itself. Also their courage to make hard and ruthless decisions to establish their priorities speaks for itself. Had they dallied for more than two hours and 40 minutes and taken no action, undoubtedly all of the passengers, men, women and children, captain and crew, all would have gone down with the Titanic. Websters Third New International (1961) Dictionary defines triage as “the sorting out and first-aid treatment of battle casualties in collecting stations at the front before their evacuation to hospitals in the rear.” Evidently its consideration is mainly concerned with battle casualties, but the same principle applies to any major or minor disaster, whether connected with open warfare or not, and that principle is this : In case of disaster, if you cannot save them all, priorities have to be established and hard decisions made as to who can be saved that is worth saving. Using the above principles as our guideline, let us now take a hard and ruthless look at a major disaster that is shaping up in the world today, a disaster of such magnitude that it would eclipse a million Titanics. In so doing let us make one important distinction between the word ruthless and the word “cruel.” Nature may be ruthless in culling out the weak, the meek, the misfits and the degenerate. This does not mean that Nature is cruel. On the contrary, in making sure that the strongest, the healthiest, the most competent and the best survive to procreate and bring in the next generation of a species, Nature is carrying on its benevolent programme of building a better species and a more orderly world. Were Nature to promulgate the reverse principle, i.e., “the meek shall inherit the earth,” as per the Jewish bible, the world would soon be populated by a sick, crippled, degenerate horde of miserable misfits and panhandlers, be they birds, animals or people. In short, Nature has established priorities and is ruthless in carrying out its programme of culling out the misfits. This may be ruthless, but it is not cruel. In its final analysis, it is a highly beneficent, creative and constructive programme, a programme which Nature in its infinite wisdom has pursued from time immemorial. Having established our concept of triage, let us now take a look at our Planet Earth as it now exists in the light of the emerging 21st century, and especially as it portends to the future of our own species, the White Race. While we are taking a cold, hard look at this crucial phenomenon, let us also keep in mind that we have now been forced into a situation where it is imperative that we establish our top priorities, whom we want to save and whom we can save. When we look at the world today, we find it to be one horrible mess, a basket case, a total disaster of a magnitude that never before has faced mankind. Whereas for hundreds of thousands of years mankind has been slowly advancing along a bumpy road, it has, nevertheless, spasmodically advanced to ever higher levels of intelligence and creativity – groping ever upwards in a spiral of a constructive civilization. 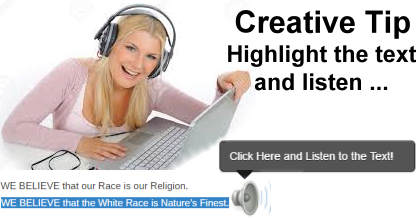 The main and only significant species in this miraculous advancement has been Nature’s Finest creation, the White Race. This upward and forward momentum was seriously jolted, in fact reversed, when the Jews introduced a virulent disease of the brain – Jewish Christianity – on the mentality of the then great Roman civilization of 2,000 years ago. After a slow and painful recovery the White Civilization was further torpedoed and set back by World War I when the Jewish conspiracy inveigled the nations of the White Race in a suicidal and fratricidal war of global dimensions, with White Men viciously and cruelly decimating millions of their own White brothers for the most asinine of reasons and pretexts. The White Race had hardly recovered from this catastrophic disaster when Jewish money power inveigled the White Race into the Second World War, even more devastating and destructive than the first. Speaking of cruelty, no incident in history has been more unjustified, stupid, asinine and cruel than was Jew-instigated World War II. In an insane rampage White Men were killing White Men on an unprecedented scale, by using the most effective of modern technological weapons invented by the White Man himself. When the Jewish-led coalition of White nations defeated Nazi Germany in 1945, it was the greatest victory the Jewish conspiracy had ever won, and one which they lost no time in capitalizing upon. It was a disaster of infinite magnitude for all of the White Race, including the so-called victor nations. However, it was by no means final, and we Creators want to make sure that Jewish atrocity will be avenged and reversed. Since 1945 the White Race has ignominiously and repeatedly retreated before the Jewish-led conspiracy of expanding the dark races and shrinking the White Race. If we take an honest look at the world today, it is appalling. It is, in fact, a world that has gone stark, raving mad, the White nations included along with the dark races. Everywhere there is a revolution going on, there is a breakdown of law and order, a breakdown of civilization. There is starvation, there is violence, there is chaos. It is indeed a world gone stark, raving mad. Yet, because of the subsidization and feeding of the dark people by the White Race, mostly the United States, the dark people are multiplying, while the White people of the world are shrinking, fleeing and retreating. There will soon be ten billion clawing, starving people on this planet, of which the White Race now is a small, shrinking minority. We, the White Race, through our misdirected Jew-orchestrated charity, are drowning in a sea of hostile, aggressive dark races. This suicidal insanity cannot continue. We have reached a crisis that we must now face squarely and solve without any further delay or nonsense. We have reached a point of no return. This Planet Earth cannot feed, house and accommodate such huge masses of people. It cannot feed such impossible numbers, nor can it dispose of the wastes that pile up from such an overload. Hunger, starvation, mass pollution and ensuing chaos are now rampant on the face of this planet, and unless a drastic change is made now, the White Race will be the foremost casualty. Then the remaining conglomerates of dark races will fight it out. Due to starvation, disease and pollution, as Nature takes its course, she will reduce these numbers down to a small fraction of what it is now. Mankind will sink down to the lowest level of the savages, but civilization and the White Race will be gone. Natures Finest will be no more. Can we allow the oncoming catastrophe to continue ? No, we cannot ! We, the White Race, cannot save all these increasing hordes of dark races from starvation and chaos. There is nothing we can do for them, and frankly, we have no desire to subsidize and feed them any longer. We must separate ourselves from them, cut them adrift, and let them wither on the vine. The world at large, like the Titanic, is a sinking ship with a limited number of lifeboats. The best we, the White Race, can now do is to save ourselves, and to hell with the dark races. We have now reached the stage of emergency and disaster where only the principles of TRIAGE can save us, the White Race, from extinction. We must now sort out our priorities and ruthlessly put them into practice. What are our priorities ? We, the Church of Creativity, spell them out in order of importance, although, after the first few, all subsequent priorities are of major importance also, and not necessarily of lesser status as we go down the list. 1) Our first priority is the survival, expansion and advancement of the White Race. To achieve this goal no price is too high, no sacrifice is too great, and we will and we must utilize any and all means necessary to achieve this paramount goal. 2) To enable us to achieve our own survival, we must first and foremost get the Jew off the back of our people, throughout the world. For too many thousands of years they have been the scourge of mankind. DELENDA EST JUDAICA ! 3) In order that we can organize ourselves and muster the power to smash the Jewish stranglehold, we must first destroy and replace Jewish Christianity, their most powerful and insidious weapon, with a healthy racial religion of our own. 4) The basic philosophy of such a religion must be : What is good for the White Race is the highest virtue; what is bad for the White Race is the ultimate sin. Racial Loyalty and White Racial Teamwork must be the foundation of our programme. 5) Never again must the White Race be euchred into fratricidal wars of White Men killing White Men. If we must go to war, let us make damn sure we direct such war against our real enemies. 6) As Nature takes its course and the dark races wither away of their own incompetence and inability to feed themselves, we must expand our own kind and colonize all the good lands of this Planet Earth. 7) We believe that Planet Earth has a definite limit as to the number of people it can comfortably feed, house and accommodate. We believe that number is in the vicinity of one billion people. Once we are in charge of our own destiny, we can stabilize the world population at that number, and through the practice of eugenics constantly upgrade the health, intelligence and genetic quality of our people, thereby building a healthier, happier and more prosperous life for Nature’s Finest for all time to come.